The story you're about to read may seem like a tall tale. After all, Doxa T. Graphs don't surface often. Matt was told by our watch community's resident Doxa expert, analog/shift's James Lamdin, that to his knowledge less than 30 T. Graphs have been accounted for out of the nearly one thousand believed to have been produced. What's more, Matt's T. Graph is a black dial, Sub. 200 "Sharkhunter." This version of the diver/chronograph hybrid has been called, "the rarest of an already rare breed," by the man who wrote the book on Doxa watches (and the website), Dr. Peter Millar. Once Matt clicked through to the website, he was faced with murky, poor resolution photos. To make matters worse, the Doxa in question didn't have the bright orange dial known for its legibility in deep, dark depths. This particular Doxa had a black dial, the only bright spot being a pair of contrasting, light grey sub-dials.... He thought to himself, "could that be a T. Graph?" Instead of requesting more detailed photos, Matt decided to check it out in person. Yup, as if this story couldn't get any better, this blue lobster of a Doxa was trapped at a mom-and-pop antique store - a 45 minute drive from his home. 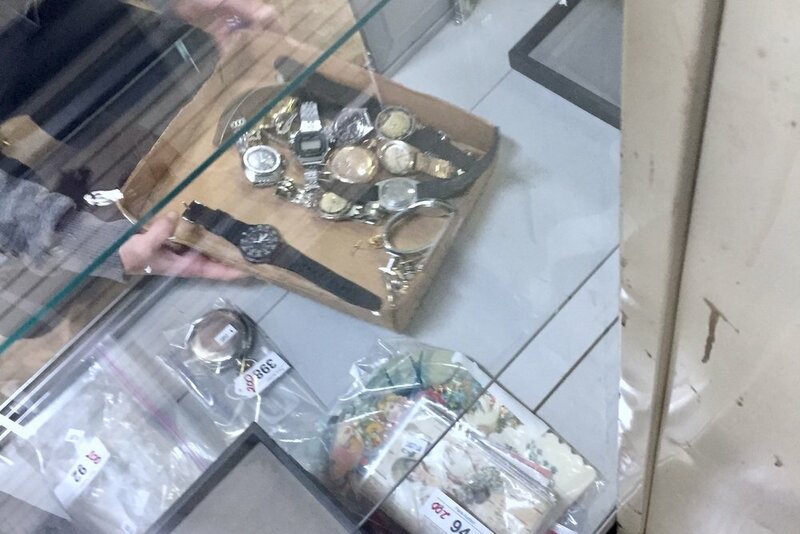 When he asked to see the watch, a young girl pulled a dilapidated cardboard box lid from a display case. As Matt sifted through the watches looking for the Doxa, he noticed a theme... The watches were mostly the diving variety. There was a small '60s Paul Portinoux, a '73 Seiko 6105-811X, an '80s quartz Casio and a '90s Luminox. Collectively they profiled someone who seemed to be an avid recreational diver. 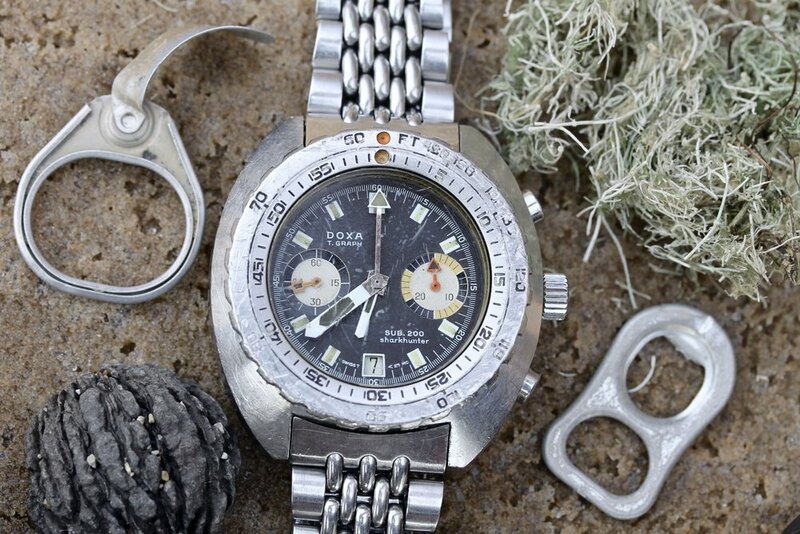 We'd like to think this Doxa spent a good chunk of its life in and around bodies of water, perhaps getting tangled up in fishing nets or knocking against the gunwale of a ship whenever the water got choppy. One clue that leads us to believe it did indeed heed its calling is a squiggly inscription on the caseback identifying a former owner, "CAPT. BOB WOLF."